MANILA, Philippines - The Superintendent list of passers and related results in the April 2017 NAPOLCOM entrance and promotional exams are available at this website as the National Police Commission officially released the results online eight (8) weeks after the date of examination. Results of promotional examinations for other positions as well as top 20 examinees are also posted. Below is the complete list of passers for Superintendent position in the aforementioned tests. 17-04-1600044, DONATO, JUDGE ROWE . 17-04-0700001, ZOZOBRADO, VINCENT AWIT The entrance and promotional examinations are administered by NAPOLCOM on April 23, 2017 at various designated regional testing centers around the country. 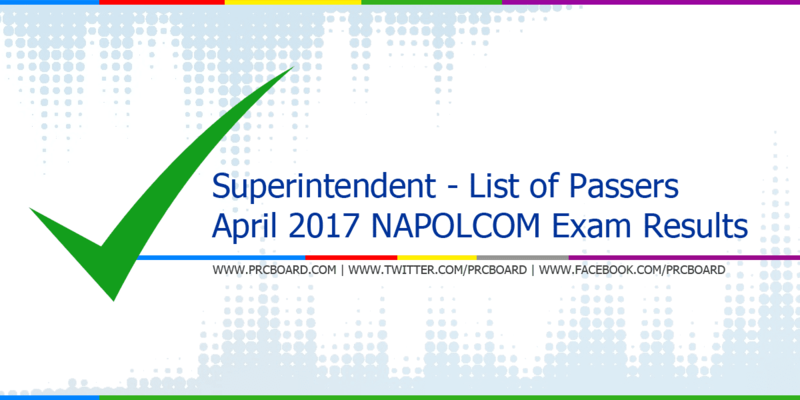 We advise our readers to visit NAPOLCOM official website, bookmark this page and follow us at our social media accounts via Facebook and Twitter to receive fast and timely updates regarding the April 2017 NAPOLCOM exam results.